During a wintry, snow dusted weekend in January, Faith Ministries World Outreach Center in South Kansas City, Missouri experienced great ministry times with Leon and Wanda Edwards, FMIN partners from Charlotte, North Carolina. Leon performed a Friday night coffee bar concert with a smooth praise and worship jazz sound. Then on Saturday morning, the women were touched and refreshed by Wanda's prophetic teaching gift as she brought forth new insights of God's love through the Song of Solomon. 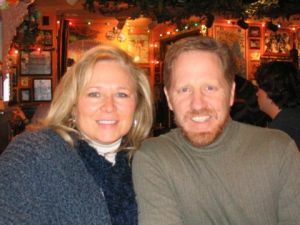 The Capras founded Faith Ministries World Outreach Center in Kansas City in 1994. This enthusiastic, focused ministry duo work together as a team training leaders, evangelizing, teaching around the world and promoting creative local outreaches. This is all what the relationship does.Expanding the Kingdom of God together. When a partner visit to encourage the other one,it adds a new taste to the Good news.keep up the good works bretheren,you were all connected for that purpose;to destroy the works of the devil.